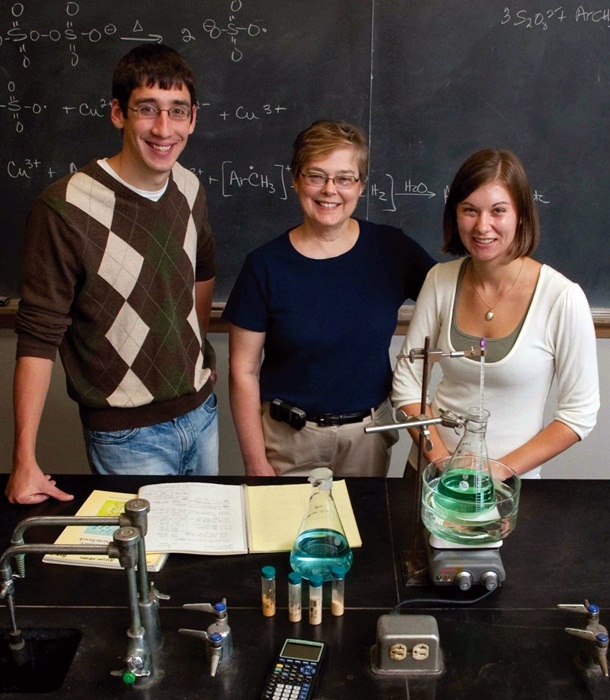 I’m part of the Organic Chemistry – Advanced Organic Chemistry team at Augsburg, teaching lectures and labs. In addition, I teach Principles of Medicinal Chemistry, my specialty area. In spring 2013 we launched a new course titled The Chemistry of Biological Systems, a true chemistry course, for chemistry majors, that examines chemical biology of both plant, animal, and prokaryotic life. This is all “where the fun is.” We have a fantastic group of students here and we love to bring them all to the highest level of achievement and understanding that they can attain. Inspiring them through coursework, research, and friendly conversation is our best contribution to the next generation of teachers, physicians, researchers, health professionals, and informed citizens. Hanson, R.N. ; Kirss, R.; McCaskill, E.; Hua, E.; Tongcharoensirikul, P.; Olmsted, S.L. ; Labaree, D.; Hochberg, T.B., “Targeting the estrogen receptor with metal-carbonyl derivatives of estradiol”, Bioorganic & Medicinal Chemistry Letters, 22, (2012), 1670-1673. Olmsted, S.; Hanson, R.N. ; Tomgcharoensirikul, P.; McCaskill, E.; Gandiaga, K.; Labaree, D.; Hochberg, R.B., “Synthesis and evaluation of 17a-E-20-(heteroaryl) norpregn-1,3,5(10),20-tetraene-3,17b-diols[17a-(heteroaryl)vinyl estradiols] as ligands for the estrogen receptor a ligand binding domain (ERa-LBD)”; Bioorganic & Medicinal Chemistry Letters, 22, (2012), 977-979. Pham, H.T. ; Hanson, R.N. ; Olmsted, S.L. ; Kozhushnyan, A.; Visentin, A.; Weglinsky, P.J. ; Massero, C.; Bailey, K., “Synthesis of 6- and 7-propargyloxy derivatives of 4-(3-fluoroanilino)- Quinazoline”, Tetrahedron Letters 52 (2011) 1053–1056.